Now here’s an electric off-road vehicle that has a spider-like profile and some very impressive moves. 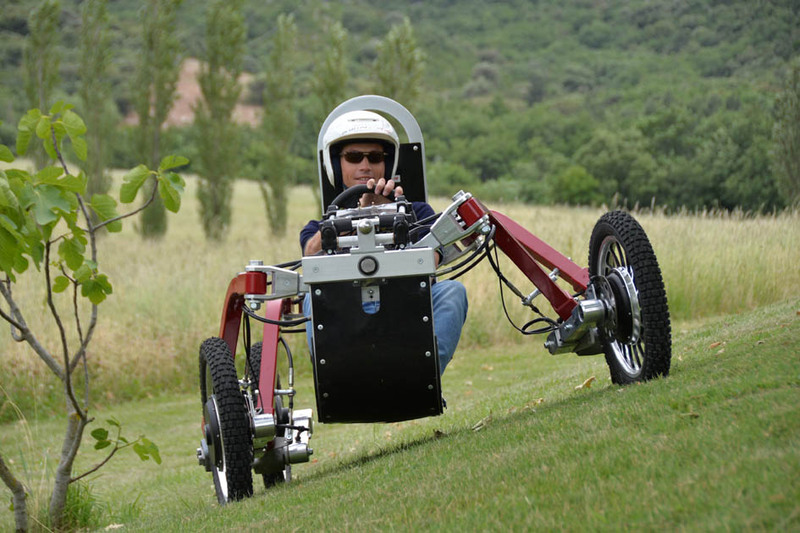 A creation out of France, the Swincar E-Spider is billed as an ATV alternative. From manufacturer Mecanroc, the Swincar has a two-seat version in the works as well as a model with special controls for people with disabilities, and one controlled with a joy stick. What’s so unusual about the Swincar is that each wheel is driven by a 1.5 motor to deliver huge amounts of torque almost instantly. A traditional steering wheel turns the front and rear wheels in opposition. Made of machined aluminum, the vehicle’s swaying is helped by sealed bearings that pivot crossbeams of the chassis in a concept that utilizes the fully independent suspension at an entirely new level. This suspension incorporates tilting of the driver’s cell to keep the center of gravity adaptable to whatever terrain you’re traveling over. The kinematic exchange allows inclination during the turns, correcting tilt on even the most extreme slopes. In development for eight years now, the company is looking to find investors, distributors and partners now that the Swincar is almost ready to debut on the market. They expect a great response to this decidedly odd-looking vehicle that moves like a spider. The design allows a very different kind of ride over uneven ground. The Swincar’s wheels and the seat stay plumb as it rides along the side of a hill, with the axles crossing back and forth as it traverses ditches and rocks. Capable of climbing and descending hills up to 70 degrees steep, the driver and Swincar’s wheels simply lean into any turn in a similar move to that used when riding a motorcycle. The 1.5 watt electric motor – the battery pack is under the seat – gives it plenty of power so it can climb hills for four hours before recharging itself on the descent. Full production of this amazing vehicle is expected by the end of the year.